On a week of disappointingly mundane go-home shows for the biggest wrestling event of the year, WWE fans would've rightly expected to be handed a reprieve by the company's lauded developmental brand, but no. 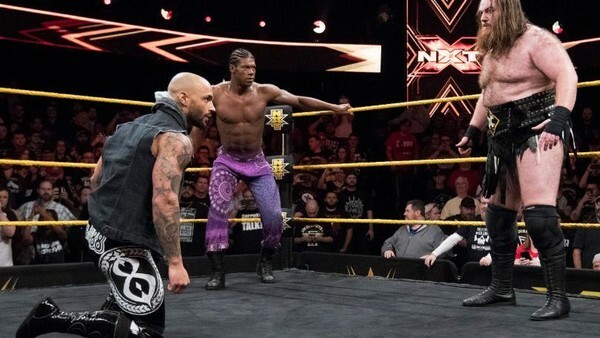 Last night's NXT was largely on-par with Raw and SmackDown, and while the show was peppered with typically fantastic video packages, the angles and segments ended indecisively. This wasn't a bad episode, but it was NXT's worst in quite some time. TakeOver is going to deliver, but these 50+ minutes did little to raise excitement levels ahead of the big event, so WWE should consider themselves fortunate that hype levels (and expectations) are already through the roof. Andrade Almas vs. Aleister Black, Johnny Gargano vs. Tommaso Ciampa, and Ember Moon vs. Shayna Baszler were built through pre-recorded footage. No problems there, as each is heated enough already, and the matches should be fantastic. Elsewhere, Killian Dain met Lars Sullivan in a preview of the weekend's North American Title match, and the Dusty Rhodes Classic concluded, but not in the way William Regal would've liked.